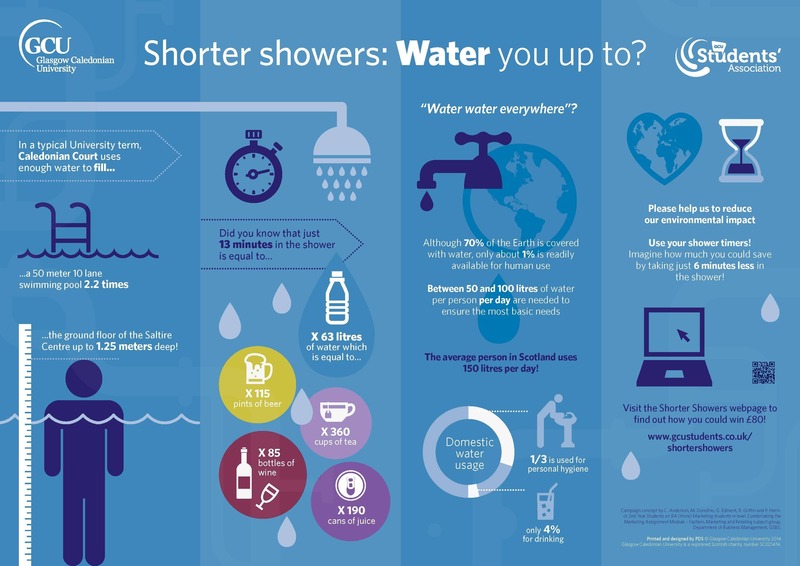 Shorter Showers: Water U up to? is a joint campaign by GCU Students' Association and GCU’s Sustainability Officer to raise awareness of the environmental impacts associated with water use. Shorter Showers: Water U up to? Few of us understand how much water we use and what impact heating it has on our energy bills or the environment. On average, each person in the UK uses around 150 litres of water per day of which only 4% is used for drinking. Heating water accounts for 25%-30% of our energy bills and contributes around a quarter of a household’s carbon footprint and 6% of the UK’s greenhouse gas emissions. Whilst it may appear that water is abundantly available, it doesn’t always rain where water is needed and treating and moving it is expensive. Making small changes to how we use water can save money and reduce our environmental impact: e.g. reducing shower time by one minute could save £15 off a person’s energy bill (per person)! If you live at home or within Caledonian Court, there are many ways you can get involved – read and click to find out more!